Make yourself at home in one of the 15 individually decorated guestrooms, featuring kitchens with full-sized refrigerators/freezers and microwaves. Your bed comes with down comforters, and all rooms are furnished with sofa beds. Plasma televisions with cable programming provide entertainment, while complimentary wireless Internet access keeps you connected. Conveniences include safes and complimentary newspapers, and housekeeping is provided daily. Enjoy a meal at the restaurant or snacks in the bed & breakfast's coffee shop/café. A complimentary local cuisine breakfast is served daily from 8:30 AM to 10:30 AM. Make yourself at home in one of the 184 air-conditioned rooms featuring LCD televisions. Complimentary wireless Internet access is available to keep you connected. Bathrooms have showers and hair dryers. Conveniences include phones, as well as safes and desks. A panoramic terrace with a ship helm overlooking the hills and Valparaiso Bay can be enjoyed at RC Deco Art Hotel Boutique, on Bellavista Hill. Rooms have splendid views. The metro station is 1 km away and there are art galleries and restaurants nearby. RC Deco Art Hotel Boutique is styled with rustic wood furnishings. Rooms are equipped with flat-screen cable TV and styled with parquet floors. They feature private bathrooms. A gourmet breakfast is served daily and guests can enjoy it on the terrace. Coffee is provided and there is a bar on site. Airport shuttles and transport to Valparaiso beaches, 10 km away, can be arranged. La Sebastiana, one of the houses owned by the famous poet Pablo Neruda, is around the corner. 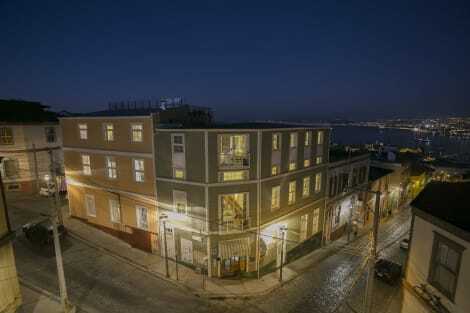 This lovely hotel is set in Valparaiso. Manoir Atkinson guarantees a quiet stay as it counts with just 7 accommodation units. Those who dislike animals may enjoy their stay, as this establishment does not allow pets. The Hotel Boutique Sutherland House is adjacent to the typical area of historical preservation of Valparaiso, in a house whose construction dates back to 1850 is with vernacular architectural style, in the Cerro Alegre . This hill is known for its valuable cultural and artistic tradition, with a large and varied range of dining establishments, lodging, exhibitions and art workshops. This allows a large number of domestic and foreign visitors. The property is linked to, especially English European immigrants who settled in Valparaiso nineteenth century port city, vibrant and cosmopolitan. The 9 rooms at Sutherland House Hotel feature large windows overlooking the bay of Valparaiso and have LCD cable TV, telephone and private bathroom with hairdryer. When you a stay at Zero Hotel in Valparaiso, you'll be in the historical district, within a 5-minute walk of Fine Arts Museum and El Peral Lift. This 4-star hotel is 6 mi (9.7 km) from Vina del Mar Casino and 0.4 mi (0.7 km) from Turri Clock Tower. This lovely hotel is set in Valparaiso. Guests will enjoy a peaceful and calm stay on the premises, as it counts with a total of 11bedrooms. Pets are not allowed at this hotel. The Astoreca Palace opened its doors in September 2012 and since that date the hotel and restaurant have been positioned as one of the best in Chile. Set in a charming historic building in Valparaiso, 100 meters from the Yugoslavian promenade, it offers elegant solariums with panoramic views of the bay. Its elegant rooms are equipped with a flat-screen cable TV and a private bathroom with bathrobes and slippers. Some offer panoramic views of Concepcion Hill. The hotel has a piano bar with a fireplace, where wines from the hotel's wine cellar are offered. Breakfast is served daily and Alegre restaurant offers fusion cuisine. The property is 4 km from Viña del Mar and its many beaches and leisure facilities. It is also 100 km from Arturo Merino Benitez International Airport. lastminute.com has a fantastic range of hotels in Valparaiso, with everything from cheap hotels to luxurious five star accommodation available. We like to live up to our last minute name so remember you can book any one of our excellent Valparaiso hotels up until midnight and stay the same night.